Small binding energy shifts of some compounds compared to cadmium metal. Collect principal Cd MNN peak as well as Cd3d. Bigger chemical shifts observed for Cd MNN compared to Cd3d. Cd3d region has well separated spin-orbit components (Δmetalsub>=6.8eV). Peaks have asymmetric peak shape for metal. Loss features are observed to higher binding energy side of 3d3/2 spin-orbit component for Cd metal. Small or negligible binding energy shifts for compounds, such as oxides or sulfide. Cd3d peaks broaden with respect to metal peaks for compounds. Use X-ray induced Cd MNN Auger peaks to aid chemical state assignment. This very soft metal is often found as an impurity in zinc. 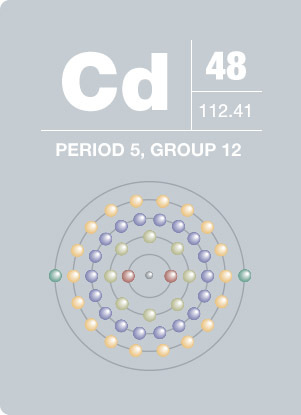 After being discovered in Germany in 1817, cadmium was produced mainly in that country for the next 100 years. Although highly toxic, cadmium and its compounds were used as a medicine to treat several illnesses in the early 1900’s. Today, cadmium is recognized as a cause of several types of cancer. Cadmium poisoning is called itai-itai disease in Japan (literally “ouch ouch” disease) due to the severe pain it causes. Cadmium is used in batteries, pigments, coatings and plating, and is used as a stabilizer for plastics.